This building will be constructed mainly of mass timber, and when it’s done, it will be one of the tallest mass-timber-and-concrete hybrid buildings in North America. The building material comes with a number of benefits — environmentally friendly, lightweight — and support from the Ontario government. Provincial rules don’t allow for the construction of wood-frame buildings of more than six storeys — the new U of T academic building was granted a building-code exemption as part of the Ontario government’s $3.15 million Mass Timber Program, which it launched last spring to jump-start the industry. The program’s other demonstration projects include a 12-storey building at George Brown College on Toronto’s waterfront, a condo development in downtown North Bay, and an eight-storey office building in Toronto. Mass timber is on the rise in Ontario, but it won’t become commonplace until building codes change (the Mass Timber Institute is already advocating for this), local supply chains make for cheaper prices, and large developers start using it. “This is a new kind of wood product; it comes out of R&D and scientific research,” said Anne Koven, adjunct professor of forestry at U of T and a member of the newly formed Mass Timber Institute, which promotes research and education on the material. Today’s mass-timber building materials resemble a far sturdier form of plywood. The U of T building will be constructed with cross laminated timber. Such wood structures often end up concealed beneath drywall or panelling. But designers will sometimes leave the wood exposed so that it’s visible in interior spaces or on the exterior. Architects, builders, and academics are increasingly looking to mass timber because wood is a renewable resource. “Mass timber is much more environmentally friendly than steel or concrete,” said Ms Koven. The concrete industry is one of the world’s top producers of carbon, and steel is made from iron ore, a non-renewable, mined resource. Forests, on the other hand, reduce carbon. Modern forestry practices are making the industry more environmentally responsible. 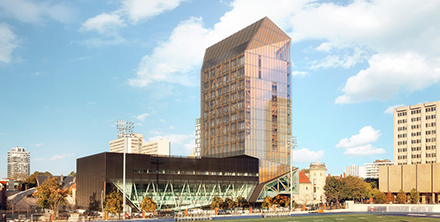 And wood is light, which means it’s ideal for towers on top of existing buildings, such as the one at U of T.
Mass-timber products can be preassembled and then easily shipped to the building site. Because urban construction is so costly and causes traffic jams, New York City and London have been building more with preassembled mass timber — full walls, full floors, or entire rooms — in recent years. Most mass-timber projects in Ontario use materials imported from Austria and Germany, which have made this a specialty. There are well-established manufacturers in Quebec and British Columbia (most mass-timber companies in Canada make, design, and preassemble as part of their services), but Ontario’s capacity is set to grow. Ontario has ample forests, and 40% of all construction in Canada happens in southern Ontario.